Leilani Estates is a census-designated place (CDP) in Hawaiʻi County, Hawaii, United States located in the District of Puna. The subdivision was formed in 1964. The population was 1,560 at the 2010 census, up from 1,046 at the 2000 census. The three month-long Kilauea Volcano eruption that occurred within and around the subdivision in 2018 claimed many homes and displaced an unknown number of Leilani Estates residents. 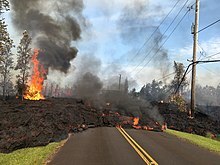 Accessing the entire resulting solid lava rock flow field has been prohibited, as per the Mayor's 12/6/18 Emergency Proclamation, with fines up to $5,000 for violations. As of January, 2019, in further effort to prevent the private subdivision from becoming a public attraction, the Leilani Community Association began enforcing regulations regarding no parking on private roads, no trespassing on private property, and no tours being conducted in the subdivision. Leilani Estates is located near the eastern tip of the island of Hawaii. It is 3 miles (5 km) south of Pāhoa and 23 miles (37 km) south of Hilo. It is bordered to the southeast by the Malama Kī Forest Reserve. According to the United States Census Bureau, the CDP has a total area of 4.03 square miles (10.45 km2), all of it land. Leilani Estates is located directly on a stretch of the lower East Rift Zone of Kīlauea volcano, in lava flow hazard zone 1. Zone 1 includes the summit and rift zones of active volcanoes—new eruptive vents can spawn anywhere inside this zone. Approximately 10% or 50 square miles (100 km2) out of the 500 square miles (1,000 km2) of Puna have been covered by lava flows since 1790. 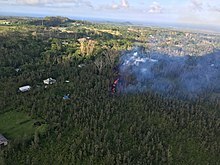 Of the 24 total volcanic fissure vents that formed during the event, 14 erupted lava to varying degrees within Leilani Estates. Fissure 8 on Luana St. was the dominant vent that produced the most output of lava, with fountaining as high as 330 feet  and flow front advancement as fast as 76m/hr  as it reached the ocean miles below Leilani Estates. By the time the eruption ceased on August 9 of 2018, around 200 homes had been destroyed within the subdivision. As of the census of 2010, there were 1,560 people in 696 households residing in the CDP. The population density was 371.4 people per square mile (144.4/km²). There were 807 housing units at an average density of 192.1 per square mile (74.7/km²). The racial makeup of the CDP was 63.4% White, 1.4% African American, 1.8% American Indian & Alaska Native, 6.1% Asian, 6.2% Native Hawaiian & Pacific Islander, 1.2% from other races, and 20.0% from two or more races. Hispanic or Latino of any race were 9.8% of the population. There were 696 households out of which 18.1% had children under the age of 18 living with them. The average household size was 2.24. In the Leilani Estates CDP the population was spread out with 17.4% under the age of 18, 6.9% from 18 to 24, 11.7% from 25 to 34, 17.6% from 35 to 49, 32.9% from 50 to 64, and 13.4% who were 65 years of age or older. For every 100 females, there were 113.1 males. For every 100 males there were 88.4 females. The median income for a household in the CDP at the 2000 census was $31,540, and the median income for a family in 2000 was $32,692. Males had a median income of $30,500 versus $22,875 for females in 2000. The per capita income for the CDP in 2000 was $15,522. About 13.7% of families and 21.9% of the population were below the poverty line in 2000, including 16.4% of those under age 18 and 25.5% of those age 65 or over. ^ "Chapter "Leilani Estates History" at leilaniestates.org". Retrieved May 31, 2018. ^ a b "Geographic Identifiers: 2010 Demographic Profile Data (G001): Leilani Estates CDP, Hawaii". American Factfinder. U.S. Census Bureau. Retrieved June 1, 2017. ^ "County of Hawaii - Civil Defense Alerts and Information - Sixth Supplementary Emergency Proclamation". www.hawaiicounty.gov. Retrieved 2019-01-10. ^ Wright, T.L. ; Chun, J.Y.F. ; Exposo, Jean; Heliker, Christina; Hodge, Jon; Lockwood, J.P.; Vogt, S.M. (1992). "Map Showing Lava-Flow Hazard Zones, Island of Hawaii". USGS Pubs Warehouse. U.S. Geological Survey. Retrieved 2017-12-30. ^ Program, Volcano Hazards. "USGS: Volcano Hazards Program HVO Kilauea". hvo.wr.usgs.gov. Retrieved 8 May 2018. ^ "ArcGIS Web Application". hawaiicountygis.maps.arcgis.com. Retrieved 2019-01-10. ^ "USGS Volcano Hazards Program Movie". volcanoes.usgs.gov. Retrieved 2019-01-10. ^ "Preliminary summary of Kīlauea Volcano's 2018 lower East Rift Zone eruption and summit collapse" (PDF). volcanoes.usgs.gov. USGS. Retrieved 2019-01-10. ^ duPont, Dane. "Addresses of Homes Lost in 2018 Puna Eruption". ^ a b c ASD, Website Services & Coordination Staff,. "2010 Demographic Profile - U.S. Census Bureau". www.census.gov. Retrieved 8 May 2018. This page was last edited on 15 April 2019, at 00:37 (UTC).